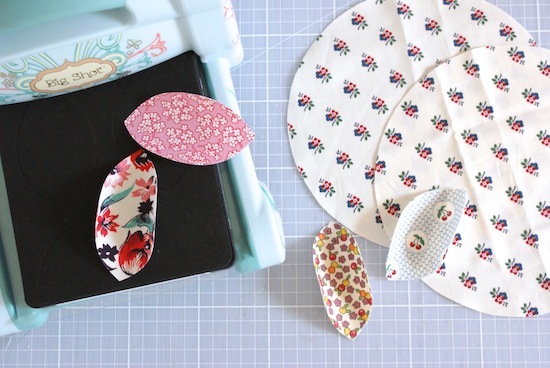 Hello friends, and welcome if you're joining me for the first time from the Sizzix blog. So do you fancy a quick gift idea you can whip up for your quilty friends? Great, because I have the perfect pincushion you can make in a jiffy with your Sizzix machine! 1. Cut out four scrap pieces of fabric large enough to cover the leaf shape, iron the wrong side of the fabric to the shiny side of the fusible paper. 2. Run the fused fabric through the Sizzix machine to make up four leaves. 3. Use a side plate or compass to draw out two circles to make up the pincushion top and bottom, allowing enough space to fit the leaves. 4. Cut out the two fabric circles. 5. Peel off the paper backing and adhere the leaves so the centre points meet - don't worry about it being too perfect as the button will cover up the very centre. 6. Press into place, and use a decorative edging stitch on your machine. 7. Place the two circles right sides together and sew - leaving a small gap for turning. 8. Trim into the seam allowance a little to ease the bulk. Turn right sides out and stuff. Whipstitch the gap closed. I hope you enjoyed the little project, if you're after some more Christmas idea's to make be sure to check out the rest of the blog tour … here's the lineup! Wednesday 19th November - Me! Great project, I love the finished look of your pincushion, tfs. Pincushion is very beautiful and nice idea for gift. You can finaly find a needl at once. Your pincushion is so cute, Jessie! Thanks for the tutorial! Love this, it's so pretty! this is a great little pincushion Jesse! I love that we both used the same die and came up with different things too! Wonderful pin cushion! I love your colour and pattern combo!